If you missed out on RingPlus' free phone service giveaway this morning, the Sprint MVNO is running a new "Afterhours" promotion tonight (12/10) at 10 PM PST. 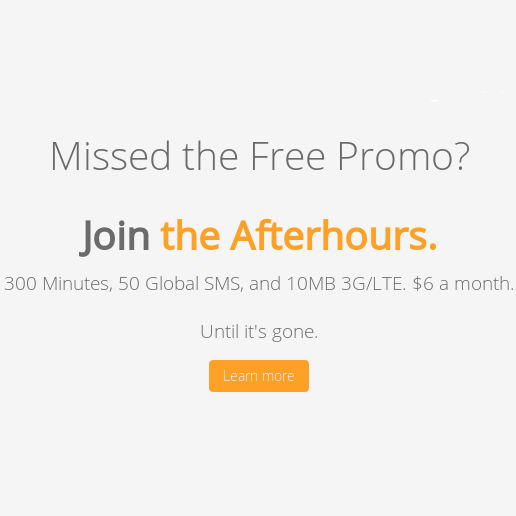 This one offers 300 Minutes, 50 Global SMS, and 10MB of data for $6 a month. 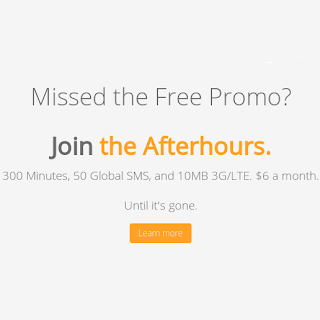 Extra minutes, messages and MBs of data are 2¢ each. While it's not free, tonight's promotion is still a pretty good deal. RingPlus least expensive regular plan, the $5.99 per month "Harrison" doesn't include any minutes, texts or data, the $5.99 just keeps your number active. You also need a cash balance to cover calls, data and texts at 2¢ per minute, message or MB. As with all of RingPlus' current plans you need to "Bring Your Own Sprint Phone". The phone can't be currently active on Sprint or another Sprint MVNO. iPhones, BlackBerrys, Palm phones, PTT devices and Boost and Virgin Mobile phones and most Sprint phone models released in the last 12 months are NOT allowed. There's a list of allowed (and not allowed) phones on the Ring Plus Site. Before or after the sale starts can check if your phone is allowed by entering the MEID or ESN at https://my.ringplus.net/device_validation_requests/new. When the sale starts return to https://my.ringplus.net/device_validation_requests/new to register for the promotional plan. I don't know how long this deal will last but I suspect it will be longer than today's free promotion which sold out in 27 minutes. Update: 1 PM PST 8/11 - The promotion seems to have ended, the $6/month 300 Minutes, 50 Global SMS, and 10MB of data Afterhours promotional plan is no longer available. It looks like the original RingPlus FREE 300x50 plans were updated to FREE 325x70x10 plans. My free 300x50 plan has been updated to the 325x70x10 plan, too. Thanks to Ringplus. Ditto, my "free" plan was also updated. Free promotion was way shorter than 27 minutes. Promo was available for 10-12 minutes. A number of 502 error gateways during that period. As expected some got in and are happy, and some did not are calling the process a scam. I think free MMS would seal the deal. The Afterhours promotional plan still shows up on the main webpage, but is not available.to select from the "Choose a Plan" drop down box. It was there before midnight, but when I checked again sometime after midnight it was gone. Of course the reason why these plans are available only on Sprint is due to the fact that this carrier has a harder time getting customers. Sprint bends over backwards to accommodate every Mom & Pop mvno. Contrast this to Verizon who have much more strict standards with their mvno's. There are not to many of them to begin with. Talk for Good is already gone. Next G is almost gone. CDMA is a newer more advanced technology than GSM which is TDMA and FDMA (except for 3G & 4G data, which are W-CDMA & OFDMA respectfully). What I like about CDMA, is you can easily activate a new (or old) phone if yours gets lost, with GSM, you better have a spare SIM (which may or may not expire after some time of non-use). Verizon and Sprint neglected their CDMA EVDO networks for years while AT&T and T-Mobile invested in Wideband CDMA technology to provide much greater 3G/4G speeds. Until Verizon and Sprint finally implemented LTE and WiMax (which did not work out), respectively. People are much better off with AT&T and T-Mobile HSPA+ as a backup to LTE than Verizon and Sprint provide with slow, out of date EVDO. Their customers do not need to buy a new LTE phone if their HSPA+ phone is performing fine. SIM cards are such a convenient way to switch phones, eliminating all the control hassles of dealing with Verizon and Sprint. Like no 4G Vzw phones on prepaid. And Sprint's micro-management of prepaid phones, especially iPhones. Not to mention Sprint's unique phones that can't be used anywhere else. Little wonder that most of the world uses GSM. They get more variety, lower prices, better quality and their phones use less battery power so they can be a little smaller and lighter.